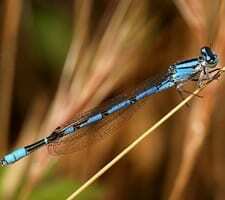 The northern bluet is a small damselfly with a length of 1 to 1.6 inches (26 to 40 mm) long. The male is predominately blue on the sides of its thorax, and the upper side of its abdomen. Its lower abdominal appendages are longer than its upper appendages. The female’s body is greenish-yellow to brown color. The upper side of its abdomen is mostly black.